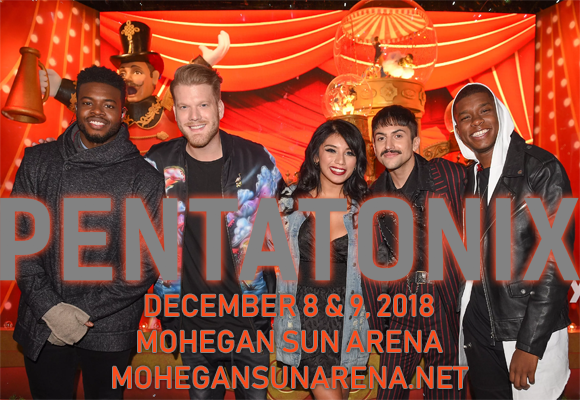 Join Scott, Mitch, Kirstin, Kevin and Matt as Pentatonix bring you their Christmas tour! Promoting their brand new holiday album, Christmas is Here!, the group is headed to Mohegan Sun Arena on Saturday 8th December 2018 for a two night run full of Christmas cheer! Expect all your favorite festive hits performed in the a capella group's own distinctive way, with songs like "White Winter Hymnal," "That's Christmas to Me," and "Santa Claus Is Coming to Town"! Originally formed with the intention of becoming the world's most popular a cappella act, American vocal group Pentatonix have grown impressively close to achieving their goal. Forming in 2011 to audition for season three of NBC's talent show The Sing-Off, the group went on to win the competition, taking home $200,000 and signing a recording contract with Sony Music's Epic Records. Their debut EP, PTX, Volume 1, was released in 2012. The group's popularity was bolstered even further with a YouTube channel, which has since gather over 13 million subscribers and 2.7 billion views, making it the 50th most-subscribed-to YouTube channel. Pentatonix have released four EPs, three studio albums and two Christmas albums, to date, all garnering critical and commercial success. The group has also won three Grammy Awards since its inception. PTX Presents: Top Pop, Vol. I, their upcoming album, is due for release this year.